Trainer Dessie Hughes summed up Our Conor's solo tour de force in the JCB Triumph Hurdle succinctly. "He jumped brilliant and just galloped them into the ground," he said. "He's a real one, isn't he? I thought and hoped he'd win, but I couldn't have imagined he'd do it like that. "He's really special. He quickened so well and the further he went the better he went. He had to be niggled a bit early when he won at Leopardstown but he was on the bridle the whole way this time. "He's straightforward to train and to ride. He's the whole package. He's a real horse, he loves his racing. "He eats, sleeps and he goes on any ground. You saw for yourselves how good he was today and I don't know how good he could be - he is very, very good. "Wonderful, I can't believe Our Conor won by 15 lengths but he looks a special doesn't he. 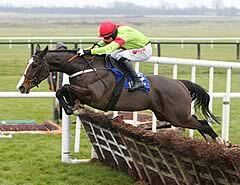 He's a Champion Hurdle horse for next year." Our Conor, who won by a record 15 lengths, was Ireland's seventh Triumph Hurdle winner, and the first since Scolardy in 2002. His next outing will be at Punchestown." The son of Jeremy was introduced to hurdles at an early age. "He showed plenty of pace on the Flat - he won over seven furlongs at Roscommon last year - and we were dying to run him over hurdles," said Hughes. "We first schooled him over hurdles when he was two and he jumped them like a natural even then." Our Conor stood like a rock in the winner's circle as his owners draped him in scarves and Irish flags and posed for the cameras with his ears pricked. "He loves all that," added Hughes, "he's rock-steady in his mind." The gelding is named after the infant son of Ciara Houlihan, whose father Dolan is one of the members of the Man About Town syndicate of owners, headed by Noel Hayes. Bryan Cooper was full of praise for 4/1 joint-second favourite Our Conor after he routed the field in the first race on Gold Cup day. The four-year-old was Cooper's second winner of The Festival following Benefficient's victory in the Jewson Novices' Chase on St Patrick's Thursday and had his young pilot dreaming of next year's Stan James Champion Hurdle after his 15-length victory. "He put them to bed very easily," said Cooper. "He travelled so well - I was there a mile too soon but he got so many gears and class - and he was very good. "He kept galloping and I could have done with a bit of company the whole way because he would have gone further and further clear. 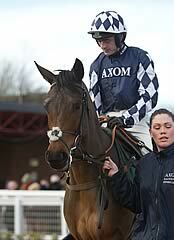 "I have never ridden a Champion hurdler but he is giving me the feel of one. He's definitely the best I've ever ridden and may be the best I ever ride - he's that good." British Flat champion jockey Richard Hughes - son of trainer Dessie - was impressed by the ride Cooper gave the horse and also thought that the juvenile could potentially be Champion Hurdle class. "It's absolutely marvellous. I didn't think Our Conor was that good but after his last performance Bryan said he was off the bridle going down the back but when he joined the leader, he took off with him. We knew he was pretty special then. "To go around there today at that pace was unbelievable. We said not to go too soon but he just let him go. "My dad works really hard and thank God he didn't run the horse at Christmas because two days later they were dragging Our Conor around the yard because he was coughing. "Richard (Hannon) has a runner at Chantilly today and a couple at Lingfield but I said to him I'm not going anywhere other than Cheltenham!" David Dickinson of the British Horseracing Authority said: "The performance of Our Conor was mightily impressive and his rating will reflect that. "I have provisionally placed him on a mark of 160, which makes him the highest-rated Triumph winner since the Anglo-Irish Classifications began, 1lb ahead of Katchit." "Beaten by an aeroplane," was Paul Nicholls' description of the defeat handed to his horses by Our Conor in the JCB Triumph Hurdle, but the champion trainer was happy enough at having saddled the second and third home. Far West, joint-second-favourite at 4/1 and ridden by Ruby Walsh, finished second, 15 lengths behind the impressive winner, while 33/1 shot Sametegal, the mount of Ryan Mahon, was another two and a quarter lengths back in third. Nicholls said: "I'm thrilled with the pair of them and I haven't thought there was much between them all season. They've run well on the day, but have been beaten by an aeroplane. "Neither horse has run on the Flat, while the winner did [he raced six times before going hurdling] - these might mature a little more with experience. I believe Far West is going to make up into a useful hurdler next season, while Sametegal definitely has the makings of a chaser. "They could both run again this season, and I'm half thinking about going to Auteuil with Far West to run in the big four-year-old hurdle." Willie Mullins, trainer of fourth-placed Diakali, said: "He jumped much better today, but I don't think the rain really suited him. The winner was very impressive - I think ours will go to Punchestown now." The JCB Triumph Hurdle was formerly run at Hurst Park and transferred to Cheltenham in 1965 on the closure of the London course. The race was originally run at the April Meeting but was moved to The Festival in 1968. The contest has only had three sponsors since transferring to Cheltenham with the Daily Express backing the race from 1965 to 1996, and The Elite Racing Club sponsoring from 1997 to 2000. The current sponsor JCB will be supporting the race for the 12th time this year. The contest is restricted to four-year-olds only and carries prize money of £120,000. The highest number of runners came in 1970 when Varma beat 30 rivals, while the smallest field was in 1965 when seven runners took part. The current safety limit is 24. No owner has won the JCB Triumph Hurdle more than once. Lambourn handler Nicky Henderson is the most successful trainer with five victories courtesy of First Bout (1985), Alone Success (1987), Katarino (1999), Zaynar (2009) and Soldatino (2010). Jimmy Uttley and Barry Geraghty are the winning-most jockeys with three wins each. Uttley scored on Persian War (1967), England’s Glory (1968) and Boxer (1971), while Geraghty partnered Spectroscope (2003), Zaynar (2009) and Soldatino (2010). Three mares have triumphed – Shawiya (1993), Mysilv (1994) and Snow Drop (2000). The shortest-priced winner is Attivo, owned by legendary racing commentator Sir Peter O’Sullevan, who obliged at odds of 4/5 in 1974. The biggest-priced winners are Baron Blakeney (1981), Shiny Cooper (1982) and Ikdam (1989), who all returned at 66/1. Eight favourites have prevailed in 47 runnings (just under 17%). The fastest winning time is 3m 51.20s, posted by Detroit City in 2006. IRELAND (6): Meladon (1977), Northern Game (1984), Rare Holiday (1990), Shawiya (1993), Commanche Court (1997) and Scolardy (2002). FRANCE (1): Snow Drop (2000). Three horses have gone on from winning the JCB Triumph Hurdle to victory in the Stan James Champion Hurdle. Persian War won the Triumph in 1967 and reeled off three Champion Hurdles from 1968-70; Kribensis won the Triumph in 1988 and the Champion Hurdle in 1990, while in 2008 Katchit added a Champion Hurdle victory to his success in the 2007 JCB Triumph Hurdle.